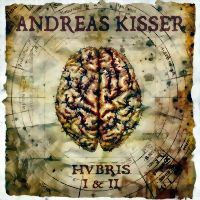 Review: "Kisser, Andreas: Hubris I & II" - Sea of Tranquility - The Web Destination for Progressive Music! Andreas Kisser is the famed guitarist of the Brazillian metal band Sepultura. Having never had the opportunity to hear his home-based band I was not sure what to expect when his new double CD entitled Hubris I & II arrived in the mail. There is no doubting Kisser is an accomplished guitarist and one can tell the new album was quite an ambitious undertaking. Kisser does not go it alone as he had help from a wide range of musicians and it is clear that great effort went into the making of this release. The album is divided into two parts with CD I containing more electric sounds and CD II focusing on acoustic elements, although these elements are not mutually exclusive from the other. The music on this release is firmly rooted in metal but takes on various moods as Kisser creates plenty of atmosphere with his guitar playing. This is first and foremost a guitar album upon which all of the other elements are built. Although there are solos, do not expect a lot of guitar pyrotechnics on display as his playing is often restrained, preferring to create different textures with the use of chord structures and plenty of riffs. Bits of progressive metal, heavy metal, Eastern sounds and classical music can be heard. Some of the highlights of the first disc include the grungy metal of "Vurgulandia" where the vocals remind me of Eddie Vetter, which I feel is one of the stronger vocal performances, and the moody metal of "R.H.E.T." with some nice acoustic guitar and a metal riff taking me back to the days of Led Zeppelin. "God's Laugh" pays more homage to Zeppelin with an Eastern tinged melody and very nice guitar playing although the vocals do not do much for me which is, unfortunately, the case for much of the album. The vocals are not bad per se, just not suited to my taste. The second CD has a stronger focus on acoustic elements with Kisser creating a moodier overall sound. There is some stellar acoustic guitar on display and the music has a more refined approach. This is a mellow listen, filled with gentle acoustic touches and dreamy textures such as the Spanish classical stylings in "Armonia" or the sweet acoustic melody in "Mythos" where there is an undercurrent of darkness scratching at the surface. The music is mostly instrumental which is one reason why I liked the second disc more. Overall, this is quite a varied release and one that I enjoyed, even if the vocals were not totally to my liking. Kisser is an excellent guitarist and shows he can handle the instrument with power and finesse. This is a strong debut and one that Sepultura fans will probably want to check out. Last year when I received a call from Andreas to talk about Sepultura's album A-Lex, he mentioned that he was working on a solo project. When I asked him what we might expect he said that it would be "different". He might me be a man of few words but he is also a guy that can make a guitar do the talking for him. For his first solo project, Andreas has reached deep into his Brazilian roots and combined the native rhythms and folklore with some electric and world music elements to make an album that is chocked full of intricate melodies and very melodic songs that will come as quite a shock for his fans from Sepultura. The two discs from this release have such a wide variety of music that it is impossible to classify it. There is everything from the Latin inspired "God's Laugh" to the infectious electric "Eu Human" with its eerie tone and snarling vocals. He even flashes some terrific guitar wizardry on the song "R.H.E.T." that leans heavily toward the progressive end of the spectrum. While most fans will take to the first disc with its more electric music, it is the second disc where Kisser pulls away from his metal background that really shines. There are still some amplified moments on this disc, the opener "Sad Soil" is a real treat as he takes the electric guitar and delivers a great instrumental over an acoustic rhythm. He has some fun with the acoustic on the flamenco tinged "Breast Feeding" and "Dominenicana" which reflect his native land extremely well but where he shines is when he seems to be playing from the heart on pieces like "Vivaldi" "Mythos" and "0120". These songs seem to tell more about where the guy comes from and has a sense of being very personal as to whom the guy real is. This might not be the perfect album but it is one that shows another side to Kisser and one that I hope we see a lot more of. He is a terrific guitarist and it shows. The only negative I can say about the discs is that I would have maybe arranged the songs a bit differently. Both of them seem to jump around from electric to acoustic and back which really hampers the flow of the albums. This is minor though and should not keep you from enjoying what he has put out. Hubris I & II are a lot of fun and both will make you wonder why he hasn't done something like this before.